Home > Others	> Why You Must Choose AngularJS for Single Page Application Development? In this article, we are going to talk about building Single page applications using AngularJS. Let us first discuss the concept of Single Page Application. The visitors on websites are not patient enough now. They want everything to work speedily. They are willing to waste their time on a website that loads slowly. So there are many ways you can use in order to improve the loading speed of your website. Most companies are now opting for single page web application to speed up the site loading and also improve the overall user experience. A Single Page Application or SPA is a type of website or web application which that can dynamically reload particular page elements depending on the interactions of the users. It helps in avoiding the loading of new pages from a specific server. This is what helps in enhancing the speed and overall user experience. SPA try to offer the same kind of experience as a desktop application. Some of the most popular single page applications users include WhatsApp Web, Flickr, Gmail etc. 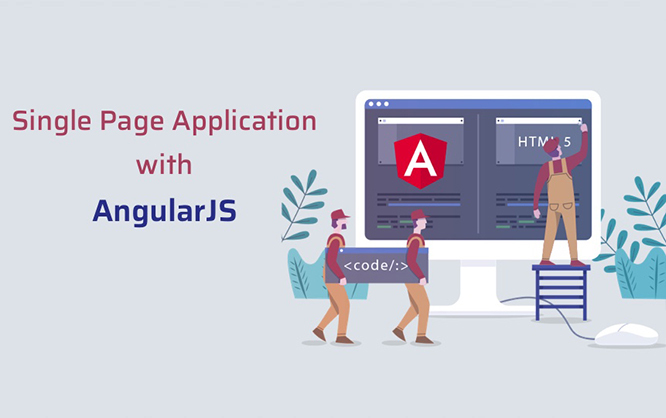 If you don’t have enough exposure on how to develop single page web applications using AngularJS, you will, first of all, have to get used to some of the most important features of a Single Page Application. The page is not exactly made to refresh or reload. In place of that, it simply adjusts itself according to the requests of the user. It then performs accordingly. Let’s take a look at some of the critical features of a Single Page Application. This will be really helpful for you if you are planning to learn about single page web application development. A strong SPA must be capable of restructuring any portion of the User Interface. It should be done without the need of an entire server-side trip in order to recover an HTML page. This is usually achieved with the help of a Separation of Concerns design theory. It is a theory that implies the segregation of data from the presentation of data. A well-functioning SPA must be able to transmit the entire UI to the client. It is said to be efficient for the overall network performance. When you increase the execution from the client side and then reduce the offline processing, the UI will have an effect on the entire network. The highlight of this feature is the flexibility it offers to the UI. It allows the developer to rewrite the application front end without even once disturbing the server. Data Binding: The automatic integration of data between the view elements and the model. Scopes: This works as lubrication between controller and view. Services: The services feature helps in arranging and sharing code through the application. Templates: Templates includes attributes and elements that belong to the AngularJS family. Directives: Directives serve as markers for DOM elements including attributes, CSS, and the like. Why you must build Single page applications with the help of AngularJS? When you develop a SPA with AngularJS framework it loads quickly. The component router delivers automatic splitting of codes which makes it possible. An AngularJS framework allows a SPA to work on every platform. When you develop SPAs using AngularJS, it offers an excellent user experience. If you prefer AngularJS for developing a SPA, the maintenance would be much easier in the future. The development of SPAs becomes easier, once you are used to AngularJS. You can build animation timelines and complicated choreographies, using AngularJS framework. It can be done by making use of the minimum number of codes. So you can develop interactive and user-friendly web applications that offer amazing flexibility.